Pretty Me Up! : LuShae Jewelry Review!! + Giveaway! LuShae Jewelry Review!! + Giveaway! Jewelry art designs offers a unique range of authentic sterling silver jewelry with a wide range of precious and semi precious gemstones. We follow celebrity and fashion jewelry trends sourcing the most contemporary high grade pieces available ensuring unmatched quality and value. We also operate a number of other retail websites in the fashion industry and have been operating online since 1999. We are a privately owned company and genuinely committed to providing an excellent buying experience. Our entire product offering is backed by our returns and exchange policy. As always we welcome all feedback and suggestions as we constantly review our sales and supply processes. 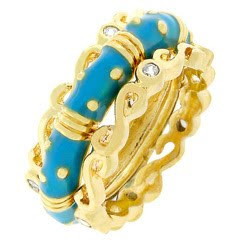 Have triple the fun with this blue enamel gold tone ring! Wear them all at one time or only wear one. You chose your style and stack 'em up! Check out our other triple sets. 14k Bonded Gold is achieved using an electroplating process that coats the item with heavy layers of 18k Yellow Gold and color-treated to a perfect 14k Hamilton gold color. When I saw this online, I thought it was pretty and unique. But when I opened the box I was blown away at the high quality and the absolute gorgeousness! I love turquoise in the spring and summer! It's also really pretty with all three bands combined- it really makes a statement! All my life people tell me I look like I have baby hands... seriously, they are that tiny. This ring makes me feel a little more confident!! "Enter our online sweepstakes competition for the chance to win $5000 cash (to spend anywhere you like). Simply display one of our jewelry badges on your blog, website or social profile page and be automatically entered each and every month. The sweepstake giveaway is open to all countries. We will also draw $200 monthly to a random winner. Every entrant will also receive a 15% discount off the entire LuShae Jewelry range!" Click HERE to enter the LuShae $5000 blogger sweepstakes/giveaway!! The following product was sent to me for reviewing purposes. That's such a interesting design for a ring. I love the floating 3 ring look it has!